Grand Master MW Brother Paul Litteral presented a check for € 2000, -to the Ronald Mcdonald House in Homburg on the 12th of April 2012. With the presentation of the check, the ACGL will sponsor a guest room for this year which will allow a family a place to reside free of charge and will support one of our fraternity’s principle tenets of helping where help is most dearly needed. 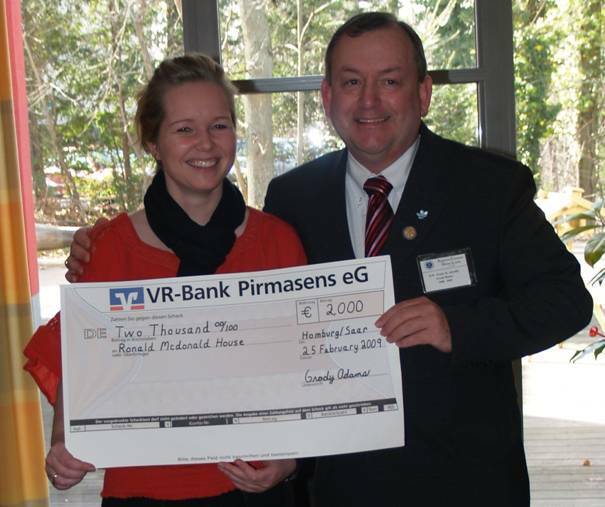 Grand Master MW Brother Paul Curran presented a check for €2000,- to the Ronald Mcdonald House in Homburg on the 8th of February 2011. M/S Silke Roeser the coordinator of the "Ehrenamt" received the check on behalf of the Ronald McDonald House. The Ronald McDonald House in Homburg is an organization which provides cost free room and board for children suffering from cancer or heart ailments along with their parents. This organization is wholly dependent on private donors for its upkeep. 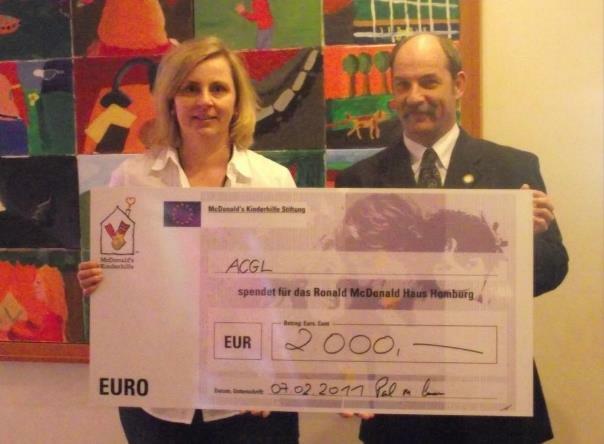 Grand Master RW Paul Curran decided to continue to sponsor the the Ronald McDonald House in Homburg and encouraged the brothers of the ACGL to donate generously with their time and money to this cause. The room which was sponsored by the ACGL in 2008 continued to be sponsored by a check of €2000,- which was presented by the Grand Master in February 2010. 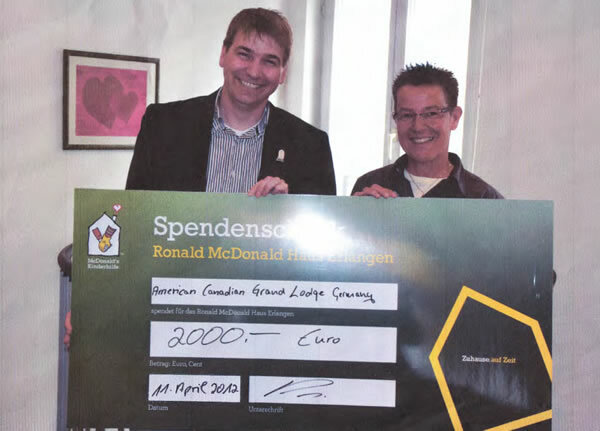 The Grand Master of the ACGL RW Grady Adams (2007-2008) presented the Ronald McDonald House in Homburg with a check for € 2000, - in addition to a Blue Ray DVD and a HD TV set on the 25th of February. With the presentation of the check, the ACGL will sponsor a guest room for this year which will allow a family a place to reside free of charge and will support one of our fraternity’s principle tenets of helping where help is most dearly needed. RW Bro. Grady Adams was also accompanied by Brethren of the Grand Lodge as well as Brethren from Mt. Moriah Two Bridges Nahe Lodge 823 - Pirmasens which is in the neighborhood of Homburg. The Brethren were given a guided tour of the House and could see the Room which they were sponsoring. The Manageress of the Ronald McDonald House thanked the Brethren of the ACGL for the welcome donation and stated that she hoped that the ACGL would continue to support the Ronald McDonald House not only by donations but by helping with other activities such as cooking for the parents of ailing children or working on the new project which was a playground for the children staying in the house.